WILLIAMSPORT, Pa. - Coming off a spirit-lifting win against FDU-Florham, the Lycoming College football team will get back in action on Saturday, Oct. 31, when it heads to Widener looking for an upset win. The Warriors (2-5 overall, 2-4 MAC) completed its best performance of the season in a 44-20 win over FDU-Florham, as the team rushed for 397 yards and five touchdowns on 59 carries (6.7 yards per carry). The defense, meanwhile, forced two turnovers and allowed just 76 yards on the ground. The Pride (4-3 overall, 4-2 MAC) are coming off a 31-20 loss to first-place Stevenson. Senior Philip Ragonaled the team with nine catches for 104 yards and a score and junior Blaine Price had eight receptions for 108 yards and a score. • Junior Blake Bowman is the first player in school history to post back-to-back four-touchdown games. • Bowman's 281 yards rushing against FDU-Florham are second in school history. • Bowman's 12 rushing touchdowns and 13 touchdowns scored are both one shy of the respective school records. • Senior Ryan Umpleby needs four more all-purpose yards to become the third player in school history to notch 1,000 three times in a career. • Umpleby is tied for fourth in school history with seven 100-receiving-yard games with Rich Kessler (1983-86). • Two Warriors are in the top 10 in the MAC in passes defended, with sophomore Mike Ward third (1.57) and senior Matt Malecki eighth (1.00). 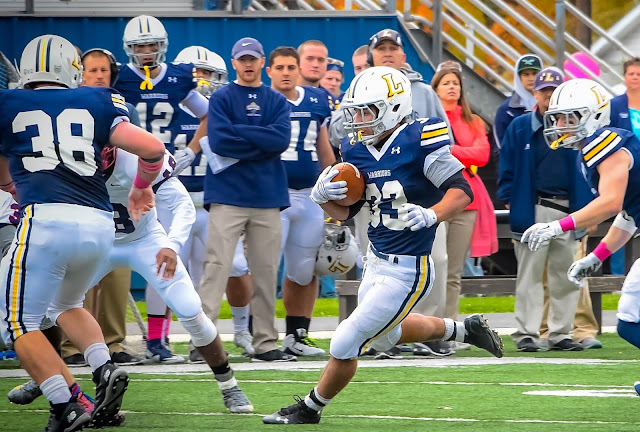 Lycoming is third in the MAC in scoring offense (27.6), fourth in total offense (378.1), third in rushing offense (204.3) and sixth in passing offense (173.9). The Warriors are led by a talented duo in junior running back Blake Bowman and senior wide receiver Ryan Umpleby. Bowman leads the MAC and is 24th in the nation in all-purpose yards (157.7). He is also the league leader with 13 touchdowns scored and his 122.0 yards per game on the ground is second in the MAC. Umpleby is third in the MAC in all-purpose yards (142.3), fourth in receiving yards per game (73.0), third in receiving touchdowns (4) and third in kickoff returns (22.9). Junior quarterback Chase Whiteman leads the league in yards per pass attempt (7.8) and he is third in passing efficiency (128.2). Lycoming is seventh in the MAC in scoring defense (30.4), seventh in total defense (373.0), fourth in rushing defense (116.3) and 10th in passing defense (256.7). The Warriors are ninth in Division III with three defensive touchdowns, as junior Tyler Smith has an interception return and junior Zach Smith and freshman Wyatt Entz each have fumble returns for scores. Sophomore Mike Ward is sixth in the league with three incerceptions and third with 11 passes defended. Junior Jon Rummel leads the defensive line, as he is eighth in the league with 0.57 sacks per game. Widener is fourth in the MAC in scoring offense (25.3), first in total offense (429.3),seventh in rushing offense (91.9) and first in passing offense (337.4). Junior Alex Krivda has started the last two games at quarterback for the Pride, but could yield to junior Seth Klein, a three-year starter that began to see action at the end of the Stevenson game. Krivda has tossed for 737 yards, five touchdowns and seven interceptions in the last two games. Klein started the first five games of the year and leads the MAC with 250.3 passing yards per game. Junior Blaine Price is second in the MAC with 84.2 receiving yards per game, senior Phil Ragona is third at 80.6 and junior Max Kutler is fifth at 62.6, giving the team three solid receiving outlets. Widener is fourth in the MAC in scoring defense (19.4), first in total defense (237.6), second in rushing defense (105.3) and first in passing defense (132.3). The team is paced by one of the top defensive lines in the MAC, led by senior Stacey Sunnerville, who leads the MAC and is ninth in the country with 1.21 sacks per game and he is 10th nationally with 2.0 tackles for loss per game. Senior Brandon Jones is a welcome compliment, sitting second in the MAC in both sacks (1.07) and tackles for loss (1.6) and senior Shakore Philip is third in the league in tackles for loss (1.4). Sophomore Christian Maiden paces the secondary, as he leads the MAC with 1.7 passes defended per game. A week after junior Blake Bowman became just the fifth Warrior in program history to score four touchdowns, he became the sixth to do it. His second four-touchdown game in a row, a first in program history, came on rushes of 12, 23, 19 and 31 yards in a 44-20 win over FDU-Florham to cap one of the most dominating two-week offensive performances in program history. Against FDU-Florham, Bowman ran for 281 yards, the second-most in program history, on just 30 carries. He scored four touchdowns at King's, with two one-yard scoring rushes, a two-yard rush and a four-yard reception. The scoring outburst has left him one touchdown shy of the school's single-season rushing touchdown mark of 13 set by Tim Deasey (2001), Jason Marraccini (1997) and Craig Needhammer (2014) and one score shy of the single-season record of 14 touchdowns scored set by Needhammer, Deasey and Brian Thompson (1998). Senior Ryan Umpleby continues to rise in the school's career record books. The Forest Hill, Md., native needs 139 more receiving yards to move into third in school history where Ryan Wagaman (2007-10) sits with 2,291 career yards. His 143 career receptions are already fourth in school history and his 18 touchdowns are one touchdown away from the top four. He is also just 18 yards away from third place in career kick return yards, where Ricky Lanetti (2000-03) sits with 987 and he is 92 yards shy of becoming the sixth player in program history to reach 3,500 career all-purpose yards. Senior Ryan Umpleby is likely to join junior Blake Bowman in the 1,000 all-purpose yard-club at Widener today. When Umpleby crosses the mark, it will be the third straight year that Umpleby teamed with a running back to post a 1,000-yard-plus duo, as Craig Needhammer '15 had 1,539 yards in 2013 and a record 1,867 in 2014, while Umpleby notched 1,052 in 2013 and 1,223 in 2014. Bowman enters today's game with a league-leading 1,104 yards. Head coach Mike Clark '93 won his 50th career game with the 44-20 win against FDU-Florham on Oct. 24. In his eighth year as head coach, Clark has led the team to six winning seasons, including five in a row from 2010-14. Clark's Warriors have won eight games three times and won MAC titles in 2008 and 2013. Despite being the fourth-longest tenured head coach in Lycoming's 114-year history of football, he is second in all-time wins, behind only Frank Girardi, who won 257 games from 1972-07.